Let's learn from these people how blessed we are to have God's Word. If you are interested in being part of providing the New Testament to a group of people that do not have God's Word, please let me know. Missionary overwhelmed with Talking Bible knowing impact it's going to make! Last year I lead a team that recorded the New Testament in Tonga to be used in Talking Bibles. Most of the Tonga people can not read. 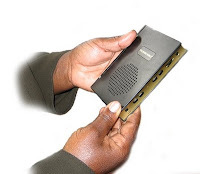 When our team delivered the Talking Bibles to a missionary, that works with the Tonga people, she fell on her face weeping knowing what it would mean to have God's Word in audio form. She has been working with the Tonga people for a long time and they only hear the Bible if she reads it to them. One of the Tonga Bibles was given to a pastor's wife who started Bible Listening Groups. After 6-months she reported to us that she had exposed 890 people to the Gospel in their own language for the first time. 380 people accepted Christ as their Lord and Savior. What a GREAT investment in building the kingdom! Cathey Anderson from Valley Center, California (She is on the Reaching the Hungry Board of Advisors) presents one of the first Tonga Talking Bibles to the Evangelical Association of Malawi. Support for the Sales Family Purchase of Talking Bibles Purchase of Soccer Ballls Talking Bibles - Recording Fund Water Well - Drilling Fund Mission's Trip Fund Most Needed Other - will contact you.